"The self-loving and overbearing husband, Oswald Grant is adequately played by Mr C Jarvis-Walter. 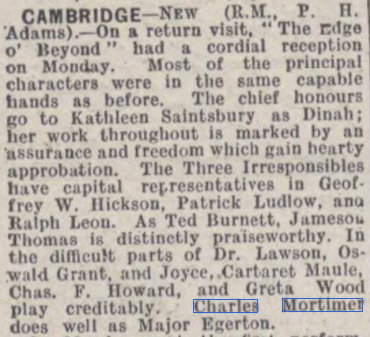 Miss Greta Wood (Truda Stuart), Miss Florence Hardy (Lady Godiva Stuart), Mr Robert Pinner (Ralph Stuart) and Mr John Turner (Hayman) fill lesser parts excellently". 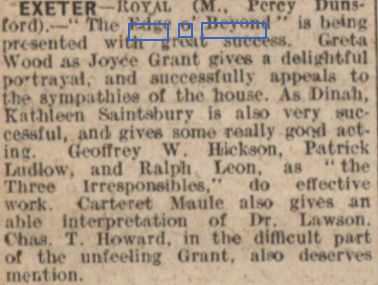 Exeter and Plymouth Gazette of 1 September 1923. "As the pathetic Joyce, Miss Greta Wood is charming". The Pleasure Gardens, Folkestone, commencing 2 July 1923 for 6 nights. 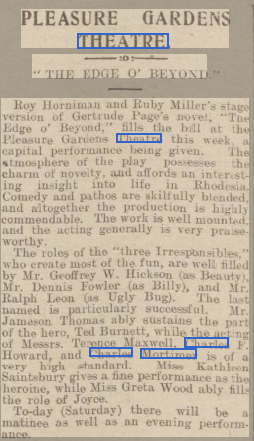 From The The Stage - Thursday 06 September 1923. Newspaper unknown - 25 October 1923. Grand Opera House, Belfast. "Joyce , in the hands of Miss Greta Wood, is splendidly acted." .... and the Grand Opera House, Belfast. An article from the Gloucester Journal of 13 January, 1923. Taken from the Devon and Exeter Gazette of 4 September, 1923. From the Hartlepool Northern Daily Mail of 4 December, 1923. "Miss Greta Wood, as Joyce, has a difficult role to fill, to which she does full justice." It is interesting to note that Greta Wood played two roles in the play, that of Truda Stuart or as Joyce. From The Stage of 13 September, 1923.